Imagine telling your dinner guests that you’re giving them rice for dessert. They may balk, even decline, but once you’ve brought the dish out for everyone to see, minds tend to change, and palates tend to become more adventurous. With a grain as versatile and well-loved as rice, the possibilities are endless for the inventive cook, but a few tried-and-true recipes and options have been around for some time, emphasizing the importance that rice has for our diets, but also for our spirits. Rice pudding is found in dozens of cultures across the world, most notably the United States, Mexico, and India. In the United States and Mexico, rice pudding (or arroz con leche in Mexico) is decadent, low-fat affair and a great option for fall. The cinnamon-sugar flavor could be topped with apples and granola to bring out a warm, cidery flavor, or a dash of nutmeg added to compliment the spicy sweetness. Readily available in most grocery stores, rice milk-based ice cream products give you all of the melty, creamy glory of ice cream without the cholesterol and allergy-irritating potential of milk. ‘Rice Cream’ is available in pints, quarts, and pints of bon bons. Rice cream is also fairly easy to make – using rice milk, rock salt, the favoring of your choice, and a few other ingredients, you add add them to an ice cream maker, and voila! Making your own ice cream also puts you in control of how much sugar you would like to consume. This Thai dessert is popular in its home country, and throughout the United States. 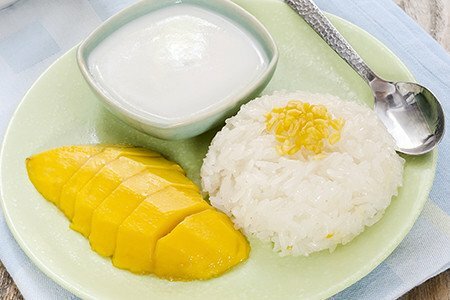 Ripe, juicy mango with a hint of tartness is paired with rice lightly sweetened with a touch of condensed milk. More condensed milk can be added to the top, or used to dip the mango slices. A vegan version can be made with coconut milk instead of regular cream. Most people in Medieval Europe spent their entire lives without ever tasting a pastry. Pastries were for the rich, and peasants were unlikely to have any rich friends. Tart of ryce, depending on the cook, was a sort of rice pudding pie, again with cinnamon sugar flavor, but also sweetened with orange juice. Kheer is very much India’s answer to rice pudding, but kheer stands out from rice pudding in the rest of the world. Kheer is used as a sweet apertif, but could also be served as a breakfast dish with nuts and dried fruit. Unlike other rice puddings, the flavor of kheer is not cinnamon-sugar, but rose-cardamom, a strong, aromatic combination that is at once pungent, floral, and relaxing. Rice cakes are something that most Americans have tasted, or snacked on, at some point in their lives. Rice cakes get a bad rap for being dry and tasteless, but there is another option for rice cakes that is quite tasty: a chewy steamed cake, traditionally eaten for Chinese New Year. The recipe is hundreds of years old, and still beloved by Chinese people the world over. Probably the most portable and convenient rice dessert, horchata is made by soaking rice, and adding cinnamon, sugar, and cream to the soaked rice. Horchata came either from Europe, or North Africa, depending on the type, but is a staple beverage across Latin America. Migrants from Latin America brought horchata recipes with them to the United States, and it remains popular.